Heres a little recipe for getting code coverage metrics for your C++ unit tests using gcc, googletest and hudson. 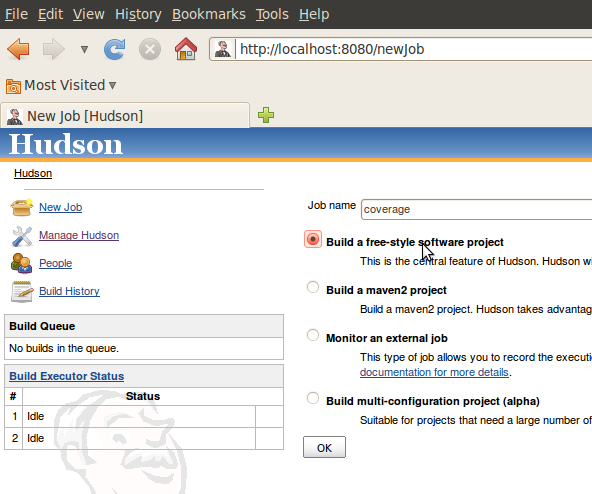 The next step is to create a hudson job for building our project. ”] Then we need a way for Hudson to get access to the source code. The typical way to do this is to get hudson to poll from your version control system. Using git this is pretty easy. drwxr-xr-x 5 hudson nogroup 4096 2010-05-31 22:33  .
drwxr-xr-x 4 hudson nogroup 4096 2010-05-31 22:33 ..
hudson@mike-laptop:/var/lib/hudson/jobs/coverage/workspace$ git  config user.email "some@email.com"
hudson@mike-laptop:/var/lib/hudson/jobs/coverage/workspace$  git config user.name "hudson"
To get gcc to instrument the generated binary with coverage and profiling (necessary for branch stats) code we must provide the compile with these two additional options: -fprofile-arcs -ftest-coverage. And we must link the final executable with -lgcov. Now when the coverage test executable is run it will output .gcda and .gcno files with the coverage statistics. These settings are set in the makefiles for the project. Breaking from TDD conventional wisdom for the purposes of this article, lets write some tests for the production code we already have. This looks like a pretty good start, right? Now lets run the tests and collect the statistics in Hudson. To do this we need to add a build step to our Hudson job. The first three lines of the command simply execute the build. The command on line 4 executes the binary test application we have built, and outputs the test result summary to a junit format XML file. The final two commands are where the magic is. This executes the gcovr script, a handy python script that converts the gcov output to a Cobertura-style XML file. 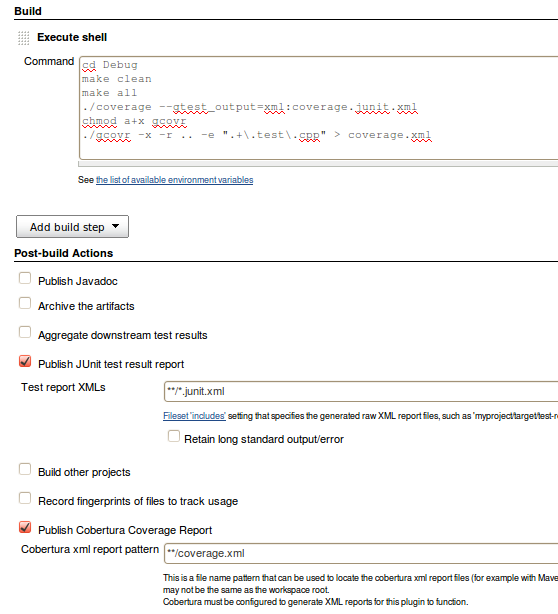 Then we have to tell hudson to search the build workspace for the junit and coverage xml files as a post-build action. 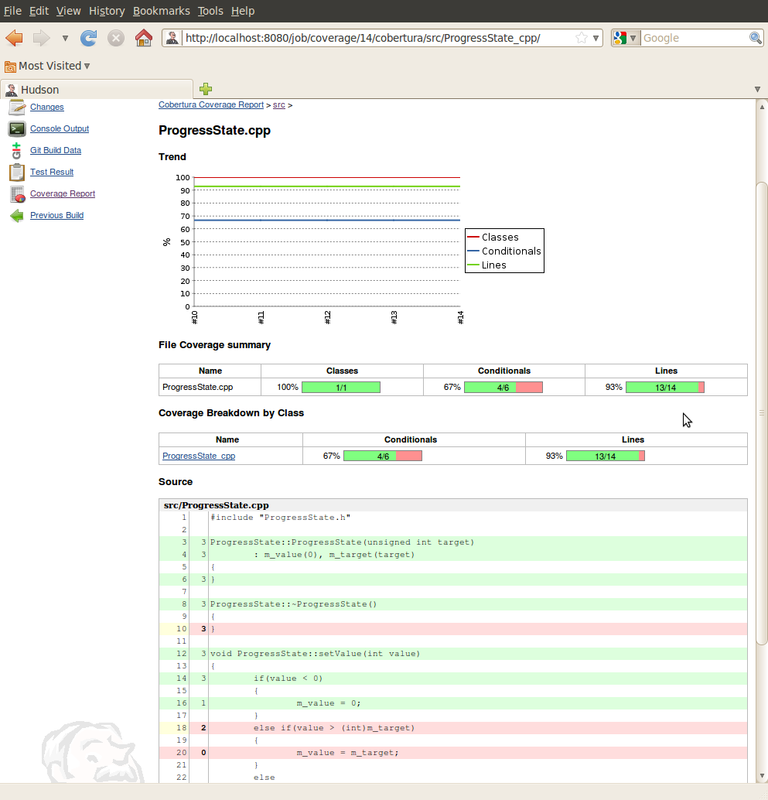 Now when we run the build we get nice overview charts trending out unit test results and code coverage. Then when we drill down into the specific source file we can see quite clearly that we have missed a test scenario. Easily adapted this to work within our SCons build. Thanks for posting this, it worked the first time! I’m using cppunit, but the rest of my setup is identical. Great, I’m glad it worked well for you both! I tried it but I can’t get any information with gcovr. Dou you have some suggestion ? Jose, what output do you get when you run gcovr? Can you give the command you entered in the shell? I solved the problem, It was a problem with the Operating System language. gcovr doesn’t work in Spanish. One question, I cannot get to source code of file, Do you know what it could be the problem ? Sorry Jose, I don’t know what that could be. If you find find out the solution please let me know. Good luck! OK. Problem solve. It was a problem about the relative paths. Cobertura didn’t find the path to source files. After some issues I managed to get this working with my C++/Qt project but the code coverage results don’t seem particularly useful because it doesn’t think I have coverage on lines that allocate memory on the heap using new or new. Is there a way to obtain more useful coverage information for my application using gcov or another open source tool that I can integrate with Hudson like this? Let me know if you find what the cause is, I find this interesting. Thank you! It works great with QTestLib too. I know that it can output results in csv, xml or html but does any one have any information using it with husdon/jenkins? Cheers for the reply. We have the report on the page type approach as a back up we would like to utilise the output in a more integrated manner. I haven’t played around with coburtura yet, or even seen the expected input file format yet; but yes I think thats the easiest approach if there is not a dedicated Bullseye plugin. First of all when having a project on unix you have to insure that your project workspace does not contain spaces (there is an advanced options in my version of jenkins to setup the project workspace “./workspace/projectname” works fine – or you can just avoid spaces in the project name). You don’t need to set gcovr to be executable every-time, if it’s in your /usr/bin directory and already executable like me it works fine. running from the CMake files dir where are the gcov files. Very nice!! Can we get code coverage using g++ as well? Just a note for a problem that plagued me with Jenkins. I found that I had to use -r to specify the full path for the pwd – and it had to have a trailing “/” – until I discovered this, Cobertura (frustratingly) failed to display annotated source. I’m currently trying to use Cobertura and LTP GCOV (LCOV) in Hudson to generate results from one set of source codes. The biggest issue I’ve seen is that the results are very different depending on what tool was used. Does anyone have an idea why the data/output is different and what would be better tool to use with Hudson? Sorry Cathy, I have now experience with LTP GCOV. Please do drop me a line if you figure this out. The cobertura does not take care of mocked functions and its report assumes that mocked function should also be covered in gtest. 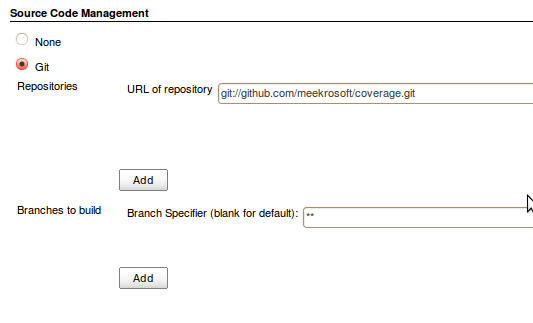 Is there a way, we can exclude mocked functions in generating the code coverage report. This is not a Coburtura thing, but more of a gcov thing. If you really want to ignore coverage for test data you will need to filter it out manually I think. I like this setup, but am having one problem. I can’t find a way to show zero coverage stats for files that are NOT executed as part of the tests. These source files will have associated .gcno files, but because they are not ran no .gcda files are produced and and gcovr doesn’t show them in the results. Has anyone found a way to get around this (like perhaps creating a pre-processing step that generates zero initalized .gcda files?) I’ve tried using touch to create such files but they’re not accepted as valid by gcov. Ah, that is a very good point. I don’t know the answer to your question, but if you find out please let me know. The code indicates that at some point an effort was made to process stand alone gcno files, but perhaps wasn’t finished? Unfortunately my code is not generic enough to submit as a patch for gcovr (assumes certain extensions for source/headers, certain conventions for comments etc. ), but it works for my purposes. Greetings from Carolina! I’m bored to tears at work so I decided to browse your blog on my iphone during lunch break. I really like the knowledge you provide here and can’t wait to take a look when I get home. I’m amazed at how fast your blog loaded on my phone .. I’m not even using WIFI, just 3G .. Anyhow, awesome blog! In the include section of the makefile on github, you include a file named subdir.mk (not the same one as in src/subdir.mk). However, you have not pushed this file to the repository. What’s in this file? Sorry, I don’t have that sourcecode anymore because of a hard disk failure :-( At any rate, the subdir.mk file is autogenerated by eclipse so if you create an empty c++ project and add the source files you should get it to build. Let me know if this doesn’t work for you. I have some issues with -lgtest and -lgtest_main flags. It should be that g++ can’t find the libraries – are you sure they are available either in the build directory or the library pat? -lgtest and -lgtest_main should be in gtest framework ? I add framework path into PATH (bashrc) but it doesn’t recognize them in your project. Sorry my linker was broken. Thanks for the wonderful guide. I got it all working. Unfortunately, it appears gcovr produces incorrect coverage analysis from gcov output. I first noticed a problem when Hudson showed nonsensical coverage results. It would show the last line of methods as uncovered, the single-line bodies as uncovered even though the method itself was marked green, and classes as uncovered even though they were shown to be used in other places in the coverage reports. 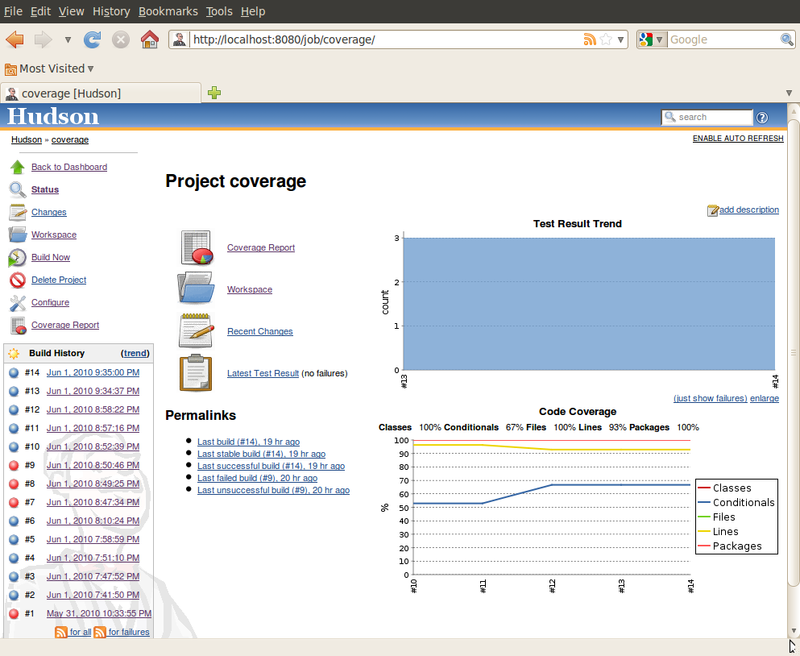 Contrarily, when I load the same “gdca/gdno” files in Eclipse’s Linux Tools gcov plugin, it shows 100% code coverage. This suggests that the gcov output is correct, but something is being lost in translation to XML format. I suspect gcovr. Unfortunately I have not the expertise with this software to pursue this any further. It was a fun project, but it will not be a usable solution for me. Sorry to hear it didn’t work out for you. Without having access to your system it is hard to know what could be wrong. You might want to talk to the maintainer of gcovr. First of all, thank you for the article. I have gtest/gtest.h: no such file or directory error.